This colorful salad holds so many nutrition. Red and yellow peppers are attractive in color & contains plenty of health benefits. 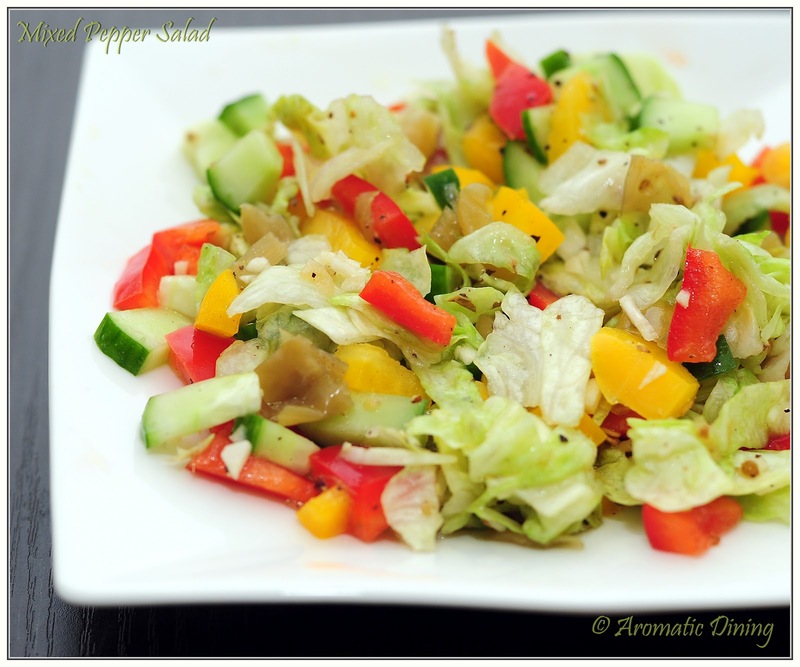 Here’s the recipe for making easy & tasty Mixed pepper salad with vinaigrette dressing in my way. 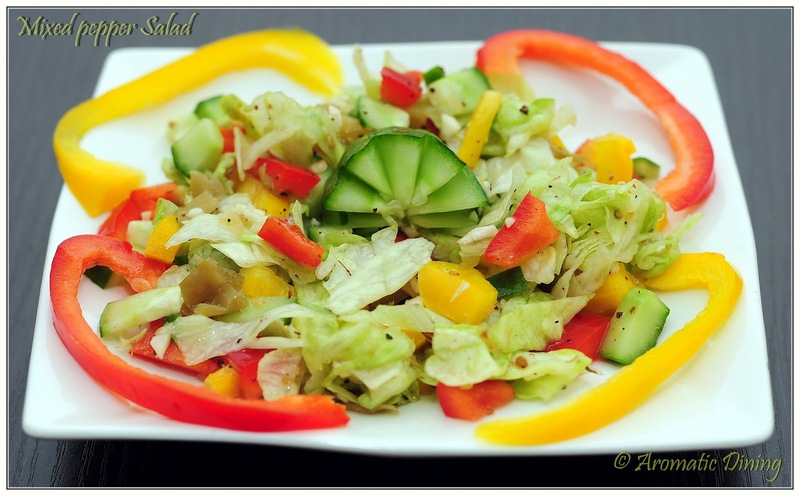 1) Wash all the vegetables thoroughly and dry them using kitchen towel. 2) Dice the peppers and cucumber. Roughly chop the lettuce and pepperoncini. 3) Place them in the mixing bowl. 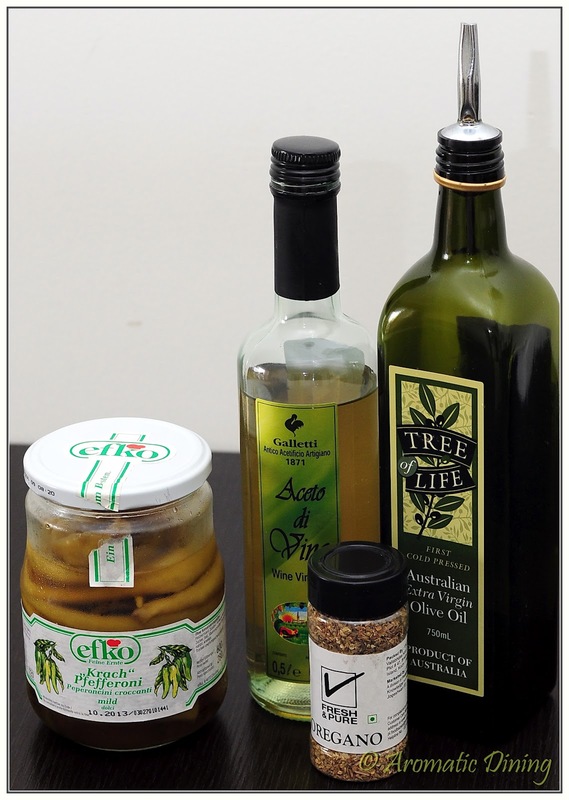 4) For making vinaigrette, take wine vinegar and olive oil in a medium sized bowl. 5) Whisk them for 2 – 3 mins or till it blends well and become thick. 6) Add the dried oregano, black pepper powder and salt. 7) Pour the vinaigrette on to the vegetables and combine well. Always I find fun to make salads. No matter what I have in my hand, it may be pickled veggies or fresh ones, meat or veg, Pasta or Tuna, creamy dressing or Vinaigrette I use to enjoy throwing in whatever available.. 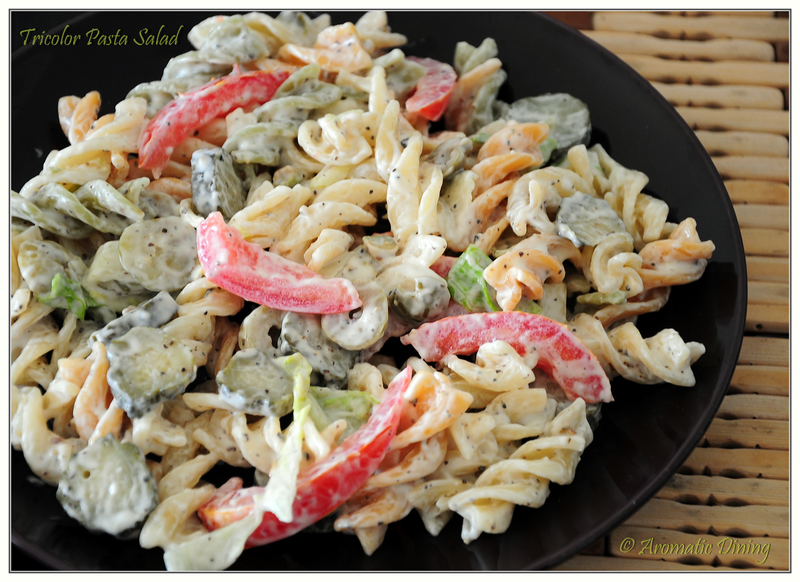 So here is one of our favourite pasta salad. Since I made this accidentally, I have used very few ingredients. Usually I use a combination of yogurt/sour cream and mayonnaise for dressing. Though I haven’t used yogurt here, I managed to make it creamy and taste the same. the instruction given in the package. 3) Mix pepper powder and salt with the mayonnaise. 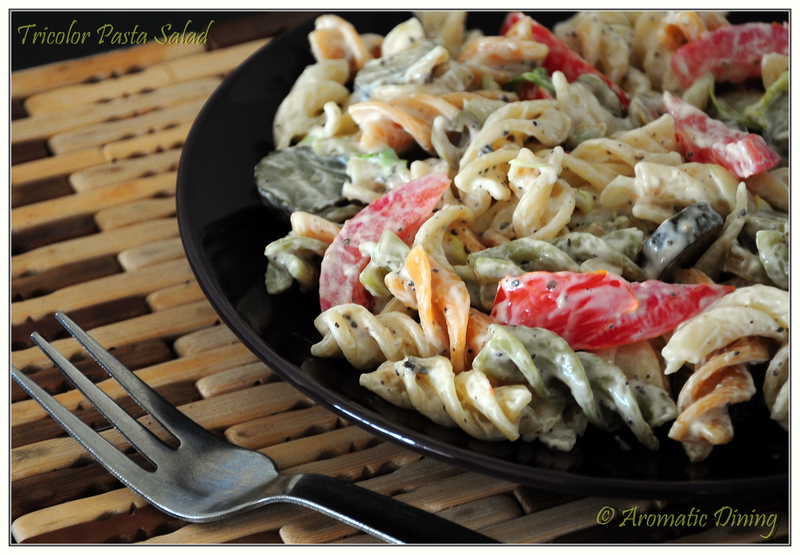 4) Combine all the vegetables and mayonnaise dressing with the pasta and mix gently. 1) If you want meat in your salad add chopped bacon, ham or any sausages. 2) I have used green olives. For colorful salad use black olives instead. This Sunday was very beautiful. After so many days being cloudy, we got to see our bright sun. Anyways we had no plans to go out since we’d been BBQ partying the whole evening of Saturday. I remember when we were staying in North China, our friends would invite us for a get-together event. We’d be around 7-8 people from different countries. Collection of breads, sausages, sauces, cheese were the dinner themes. We loved the slices of brown bread layered with cheese and sausages of our taste topped with mustard sauce. Yummy!! After we moved to Guangzhou, We missed all of that.. Our friend Martin is from Germany. Few days back he went to Germany for holidays.We requested him to bring us German brown bread. We were excited when Martin brought us the bread. But we had no sausages or cheese with us. 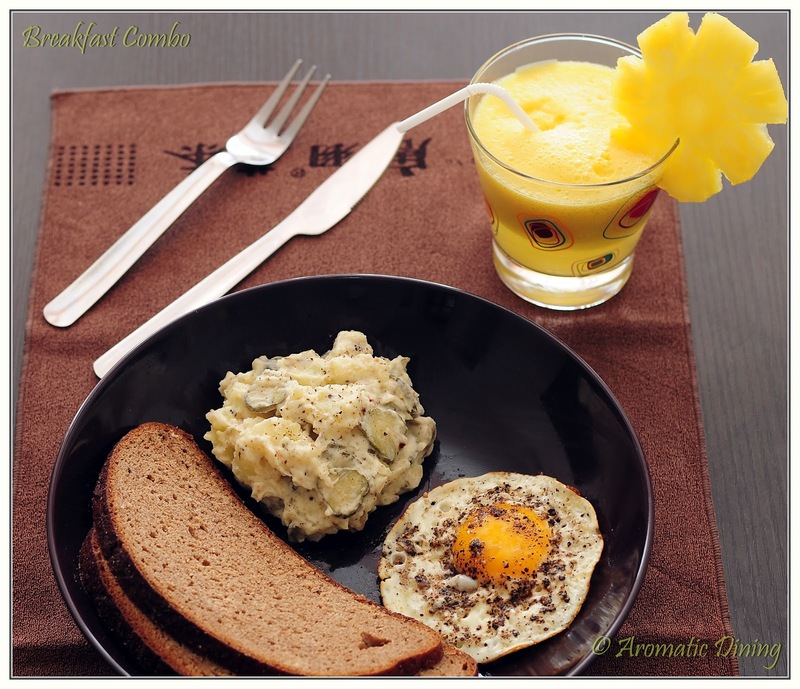 So I made some mashed potato salad and fried egg to go with the bread. And some fresh pineapple juice We loved the potato salad.. I added pickled gherkins and olive to it for extra kick..
1) Boil the potatoes with little salt in a pan for about 10-15 mins till it’s tender. 2) Remove from heat and allow it to cool. 3) Peel off the skins and mash it using potato masher or hands. 4) Chop the pickled gherkins and olives. 5) Add all ingredients to the cooled potato. 1) You can use fresh cucumber and olives instead of preserved ones. 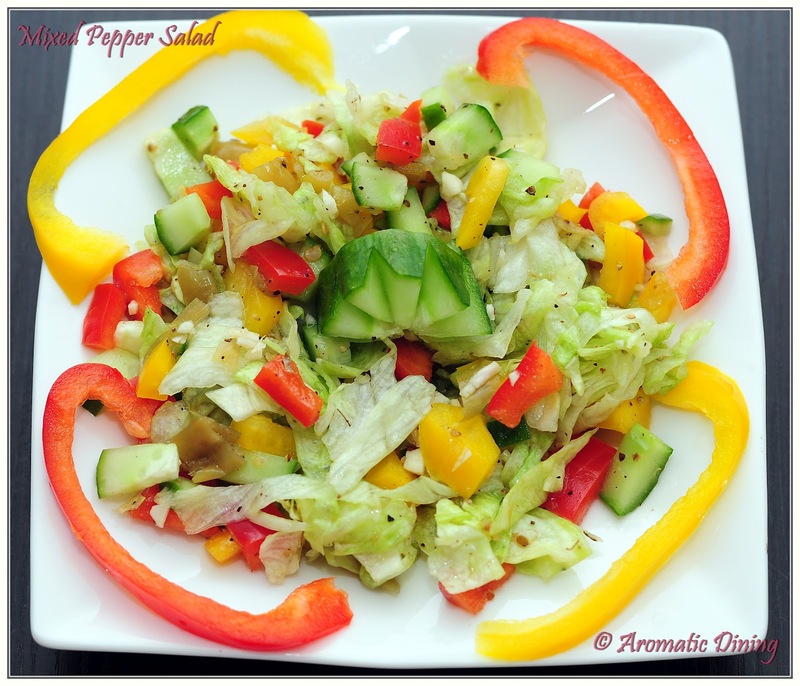 3) I have seasoned my salad with little Italian herbs since we like the taste of herbs in salad, which is totally optional. Usually the recipe don’t call for it.